French hostage freed in Colombia Jump to media player French journalist Romeo Langlois, abducted a month ago by left-wing Farc rebels in Colombia, has been released. Colombia hostage video released Jump to media player A Venezuelan televeision network has broadcast a video of a French journalist held by FARC rebels, following an announcement that he would be released. 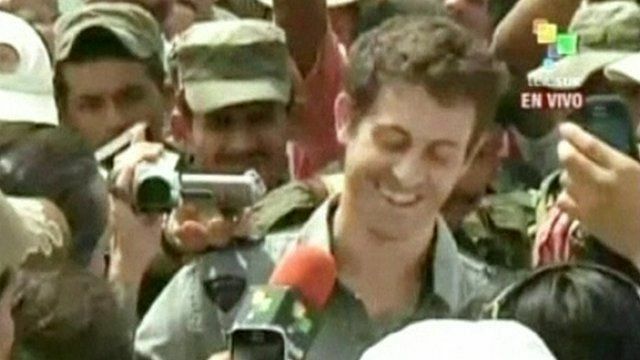 French journalist Romeo Langlois, abducted a month ago by left-wing Farc rebels in Colombia, has been released. He was handed over to a group of international mediators in the jungle in the south of the country. A smiling Mr Langlois spoke to reporters and said that he was fine and had been well-treated.